Lake Havasu Arizona is a five hour drive from Southern California, but don't let that stop you from visiting. It offers an opportunity for some amazing hiking, biking, kayaking and lakeside camping. I won’t visit in the spring because of the crowds and I definitely won’t come in the summer because of the oppressive heat. The best time to experience Havasu is in the fall when every day is sunny and 80 degrees. My preferred driving route from Orange County is to take route 10 East to Palm Springs and then head East on 62. This route is beautiful, devoid of traffic and it runs right past Mount Jacinto State Park, Palm Springs and Joshua Tree National Park. If you want to break the trip up into multiple stops, you’ll definitely have plenty to do. There are several campgrounds around the city of Lake Havasu. In the fall, they’re almost completely empty. You won’t even have to make a reservation to get a lakeside campsite. Don’t forget to bring your kayak. 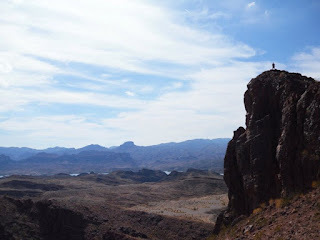 My favorite place to hike in Lake Havasu is in Sara Park. It’s just off route 95 just on the edge of town. You start by following a dried river bed into a canyon. 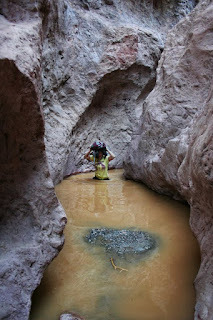 You eventually find yourself in a narrow slot canyon which is usually filled with water. You have to climb, swim, and slide through the pools. After a few miles, the trail ends at a hidden cove on the lake. You can explore the caves, take in the views and take a dip in the emerald green water. On the return trip, you can bypass the slot canyon by hiking up through the gap in the mountain. I highly recommend taking the gap on the return route because you get a bird’s eye view of the entire lake. Sara Park Trailhead: From Lake Havasu, follow 95 South to the edge of town and turn right on McCulloch Blvd S. Follow it for about a half mile to the parking area. The trail basically follows the dry riverbed wash down to the lake.